1994 KZ Montego Bay 32, Call for more details. 2009 K Z Montego Bay. 37 Foot Fifth Wheel Only owned for two years.- Beautiful inside and out. Sleeps 6- Microwave 1 king and one queen size bed- Master bedroom with door- Bathroom all in one room - Skylight in shower with glass enclosure- 2 Fantastic fans 3 electric slide outs with awnings- Gas electric propane water heater- Corian counter tops Microwave- Over sized refrigerator Dinette set with 4 chairs- Fireplace Central vacuum 2 flat screen tvs- Surround system Satellite Desk- Wash machine and dryer not a combo- 4 total Awnings 1 electric - LPG gas detector- Two central ducted air conditioners and furnace.- 2 couches one turns in to queen size bed- Also includes 2 blow up mattresses- Has huge pull through slide out drawer access from both sides. 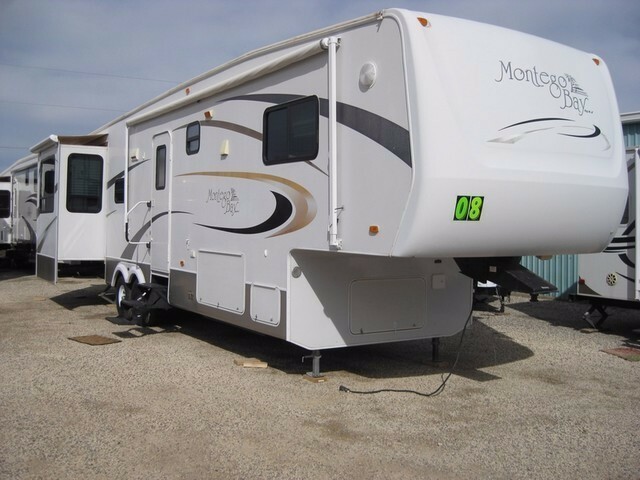 Qualified buyers may be eligible to apply for financing nationwide shipping and extended warranty. .
2007 KZ Montego Bay 5th Wheel. 37000.00 or make offer. very clean interior- 34 ft 5th Wheel camper trailer- 3 slide outs- AC- Heat Pump- Gas Furnace - Plumbed for washer and dryer - 2 TVs - After market surge protector- Cross sliding tray- Extra large storage area- Larger sewer hose - Storage area- Outside shower- After market water filter- Electric awning- After market tri pod jack for the pin- Has more ride axels- sewer flush and central vac- One owner- Used four winters in the south- No pet and smoke free- Retired couple- Bought brand new in 2008. Qualified buyers may be eligible for Financing Extended Warranty and Nationwide Shipping..
2007 KZ Montego Bay. Experience the luxurious design within and with all the comfort made possible for a complete homelike feel- 36 feet in total length and can accommodate up to 6 occupants comfortably- Predominantly with a White exterior the Montego Bays interior is more of Multi and Wood cabinetry decor- Standard features include a full Kitchen equipped with a Residential Refrigerator and Freezer- 3 burner Propane Stove a Convection oven Microwave and Double Kitchen sinks- A Hot Water heater and Heat Pump equipped- Converter Auxiliary batteries and Battery Charger equipped- Automatic stabilizer leveling jacks system included- Dual ducted and roof mounted Air Conditioner units and a ducted Furnace included- Central Vacuum system also equipped with this model- Includes a Satellite TV system for the ultimate entertainment within- Queen size bed in Master Suite- An internal shower with Skylight Toilet Sink and a Power Roof vent- 3 Slide out and 1 Power retractable Awning- Fresh Grey and Black Water Holding tanks equipped- Lots of storage compartment and closet space within- Includes a Washer and Dryer Combo for added convenience within- Smoke and pet free interior for all these years- Clear Title in Hand- This is a must see 5th Wheel and everything within works well- Serious inquiries only. Qualified buyers may be eligible to apply for Full Financing Nationwide Shipping and Extended Warranty. Triple Slide, Rear Living room. 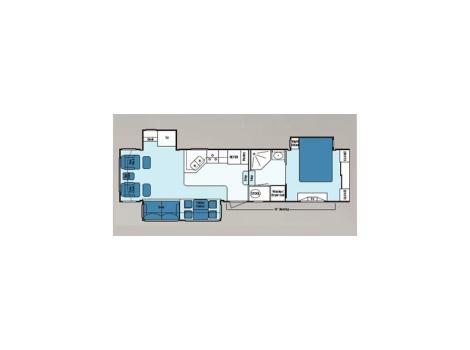 Overhead Cabinets, Sofa Slideout, Dinette Table w/4 Chairs/Ent. Center & Refrigerator Slideout, L-Shaped Counter w/Double Sink & Overhead Cabinets, 3 Burner Range, Step Up To Side Isle Bath w/Angle Shower & Skylight, Wash/Dryer hook ups, Lav w/Cabinet Overhead, Queen Bed Slideout w/Nighststand, Twin Closets Either Side of Sliding Mirror Door Wardrobe, Electric Awning & Much More. Dry weight is 11,762 LBS. 2006 KZ Montego Bay M-361KB3. Time to go away- Has been used very little in the Past- On a Scale of 1 to 10 this RV is a 9- Purchased brand new in 2007.. 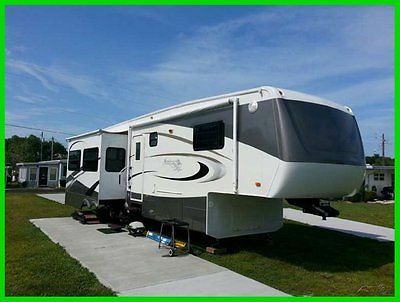 This Montego Bay 5th-Wheel Model 361KB3 is in great condition- Aluminum wheels all round- Slide out Toppers- Also Custom painted- 3 Slide outs and 1 Patio Awning- Dark Wood interior Cabinetry- Couch 2 Swivel Recliner Chairs and a Sleeper Couch included- Tan in color- Electric Fireplace- Desk area- Center Island in Kitchen with Corian countertops- Slide out Pantry corner storage for Loaves of Bread and a Coffee Maker- Overhead storage area plus lots of Cabinet storage space- King size bed in the Master Bedroom Suite- Plus a Neo-Anglo Shower- Washer and Dryer hook ups- Air Ride 5th-Wheel hitch on Camper- Kitchen with a Microwave gas Stove and a Refrigerator with Freezer- Linen Closet- Sliding Mirrored doors in bedroom - storage under bed- Expandable Kitchen Table with 4 Chairs- FanTastic Air fan and a ducted and roof-mounted Air Conditioner unit- Dual 30 Pound Propane Cylinders- Tank Flush system- Rear Roof Ladder- All 3 Slide outs have brand new Slide out Toppers installed this past May- Room Darkening shades that make it stays very cool in Florida temperatures- With heat and humidity - the Air Conditioner unit working perfectly- This Camper has been Washed and Waxed before each trip and after and stored in garage area out of the elements- A must see 5th Wheel and everything works well- Serious inquiries only. 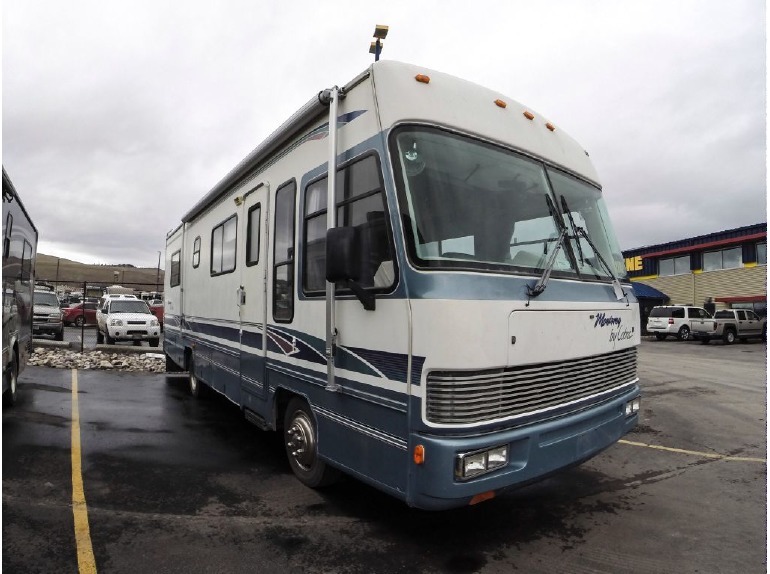 This RV is currently located in Rollinsford NH.- Qualified Buyers may be eligible for Financing Nationwide Shipping and Extended Warranties. 2006 KZ Montego Bay M-36LK3. 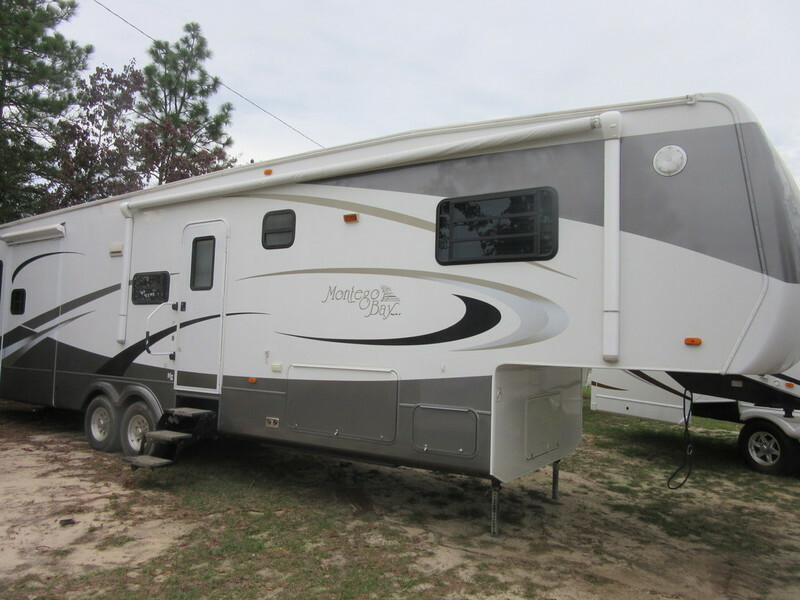 2006 KZ Montego Bay Model 36LK3 in great condition- 3 Slide outs and 1 Patio Awning- Dual ducted and roof-mounted Air Conditioner units- 2-FF Vents- Automatic Slide Awning on front- 5500 Watts Onan Propane Generator that has been Factory installed- Brand new Tires on Factory Aluminum Wheels- Set 40 Pounds Propane Bottles- 10.0 Gallon Hot Water Heater- Factory Air Shock on Trailer Pin for ride- Factory Awning Toppers on all Slides- DVD Surround Sound all throughout the Camper- Center Island in Kitchen- Washer and Dryer Hook-ups- Fireplace- Built-in Vacuum System- Pull-out Tray in Main storage compartment- Camper is in a Relatively brand new and excellent condition- This is a must see 5th Wheel and everything works well- Serious inquiries only. 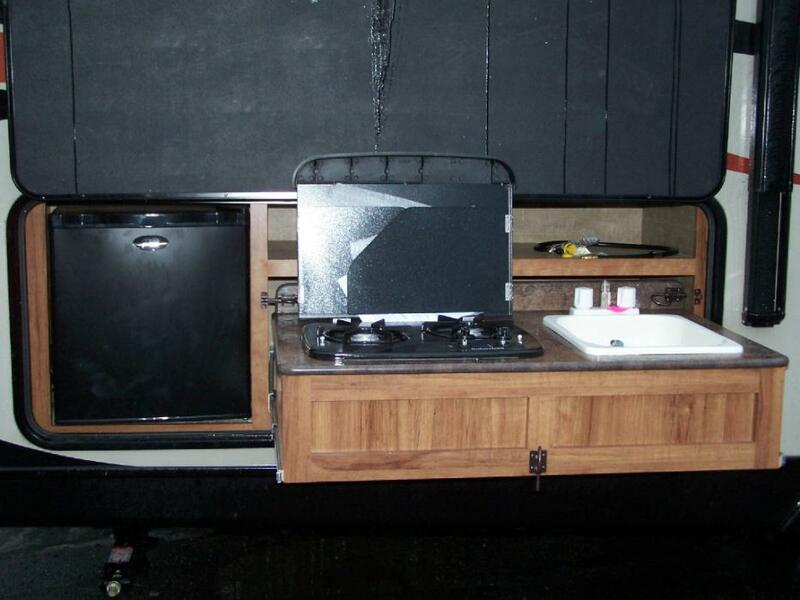 This RV is currently located in Hurricane WV.- Qualified buyers may be eligible for Financing Nationwide Shipping and Extended Warranties.